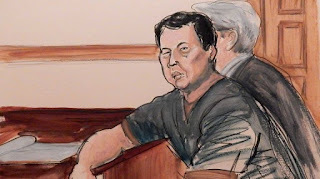 Ng during his 2017 trial. Ng Lap Seng, also known as David Ng, the Chinese owner of a Macau real estate development company, was sentenced this week in US District Court in New York, to four years in prison, fined $1m, and forfeited $1.5m, in a bribery scandal that reached into the highest levels of the United Nations. 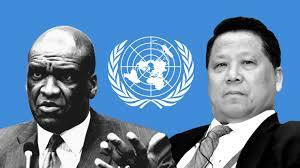 Ng, in order to convince diplomats to designate a UN conference center in Macau, to be built by Ng, bribed two senior ambassadors from the Caribbean, including the former president of the United Nations General Assembly. (1) Violations of the Foreign Corrupt Practices Act (FCPA) - two counts. (2) Payment of Bribes and Gratuities - one count. (3) Money Laundering - pne count. (4) Conspiracy. - two counts. Additionally, John Ashe, the former UNGA president, died prior to trial, alone and under mysterious circumstances that have never been explained, but who many now believe was murdered to keep him from testifying about the bribes that he received, as well as his knowledge of how Ng acquired his Dominica diplomatic passport. UN General Assembly Presiden John Ashe and Ng. Ng holds a diplomatic passport issued by the Commonwealth of Dominica, although he holds no diplomatic post of any kind, and reportedly paid a large sum in cash for the document, which violates the UN Vienna Convention on Diplomatic Relations in several ways. He is one of a reportedly five hundred dodgy individuals who have bought their "diplomatic status" in Dominica, through an illicit program that benefits only that country's corrupt and amoral senior leadership. 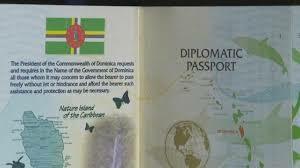 At least fifty foreign nationals holdiong Dominica diplomatic passports have been arrested, are fugitives from justice, or have otherwise run afoul of the law, abroad. Some have unsucessfuly sought to cheat justice by claiming global diplomatic immunity, which does not exist under international law. The United Nations has repeatedly ignored the fact that a number of its Caribbean members have pocketed millions of dollars by selling bogus diplomatic passports, none of which confer diplomatic immunity, or privileges of any kind, to career criminals, international sanctions violators, corruot government officials, and terrorist financiers. Some experts claim that the practice is so widespread that to expose all the UN members who are so engaged would seriously damage the image of the United Nations in the eyes of the public.